Home » Destinations » India » Andhra Pradesh » Belum Caves – Spooky and Mysterious! Someone rightly said, “The cave you fear to enter holds the treasure you seek”. Listening to all those cavemen stories, I would always wonder how it would be to live inside a cave. That’s why I visited the Krem Liat Prah in Cherrapunji which is the largest natural cave in India. Post the Cherrapunji cave visit, my imagination never wandered anymore about any cave. Recently Vidur asked me if I was interested in going to Belum caves without any further thought, I said YES. But a series of questions came back to me. What do they look like? How deep and dark are they? How were they formed etc? So the next morning, at 5 am we were on the road along with another friend, all excited to see the second largest natural cave in India. These underground caves are located under a flat agricultural field. They are open only from 10am-5pm hence we had to speed up. It took us almost 5 hours to reach the place. There was huge parking space hence we didn’t have to worry about the car and headed straight to the caves. I noticed that there are 3 well like cavities out of which the second one was the biggest and apparently it was also the main entrance to the cave which looked nothing but like a pit cave. Every beautiful thing comes at a cost and sure enough even to enter Belum caves you would be charged a small amount as an entry fee – I believe we were charged Rs 40/- per head. The caves were originally named after a Sanskrit word called ‘Bilal’ which meant ‘Hole’. Apparently thousands or even millions of years ago there was water flowing from inside these caves. These caves are also one of the longest in India covering a distance of approx 3km in length out of which almost 1.5km is traversable by tourists. The caves are formed of Black Limestone and there are almost 16 pathways including the entrance. Initially, I was very skeptical and scared wondering if the caves would be dark inside because usually I am scared of the dark and avoid anything with little or no light. 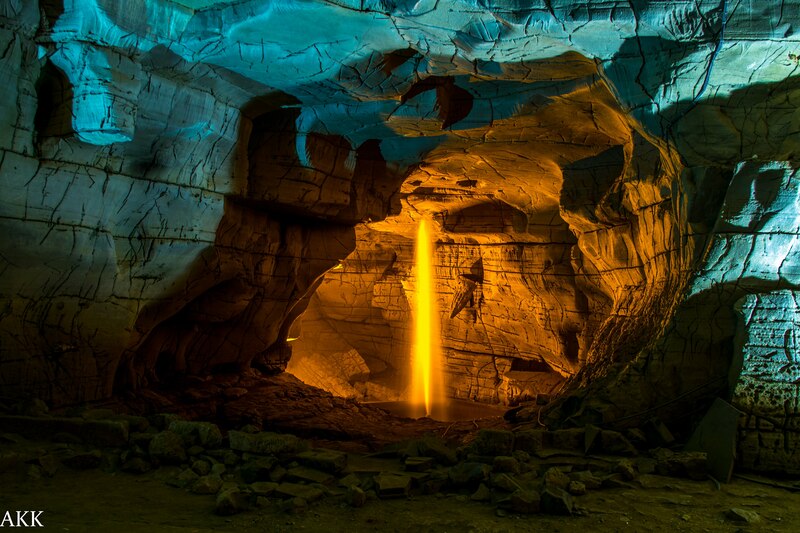 But to my surprise, these caves were completely lit up using artificial lighting …phew!! It was such a relief for me I can never explain. The deeper you go into the cave the lesser will be the air hence there are some huge pipes which were pushed inside the cave for air supply so that people don’t feel very suffocated and can breathe easily. However, there are also some areas which are dark and has almost no air. The Belum caves look gigantic and are very majestic. As we started exploring we noticed various imaginary structures such as that of a crocodile, an elephant etc on the walls. Stunning!! Vidur wanted to go and explore those dark areas and go deeper but being scared of dark and on top being an asthmatic we decided it’s better to avoid. Although there are many guides to help you through the cave yet we decided not to take a chance as I was already suffocated and gasping for air. The caves look beautiful from inside. There are long passages, spacious chambers, fresh water galleries and siphons inside. The deepest point in the cave is almost 150 feet from entry-level and is known as Pataalaganga. It is said that these caves were discovered around 1884 and are very important in a geological and historical way. The guides also told us that centuries ago the Jains and the Buddhists monks were occupying these caves and people have found many traces of the same. Many Buddhist relics were also found inside the cave. In fact, there is a giant Buddha Statue near a hillock near the caves and the area of the cave is known as “Meditation hall” used by the Buddhist monks. Belum caves is definitely a photographer’s galore. Our friend was carrying a tripod hence we spend a couple of hours taking some amazing pictures here. To visit Belum Caves there is no particular season as such but yes the time definitely matters. The earlier you go the cooler you feel because during noon when the sun is harsh and the rocks are super hot, the temperature inside becomes very hot and humid and doesn’t provide for a good experience. Interesting! Would surely plan a visit to this place soon. Stunning captures too.